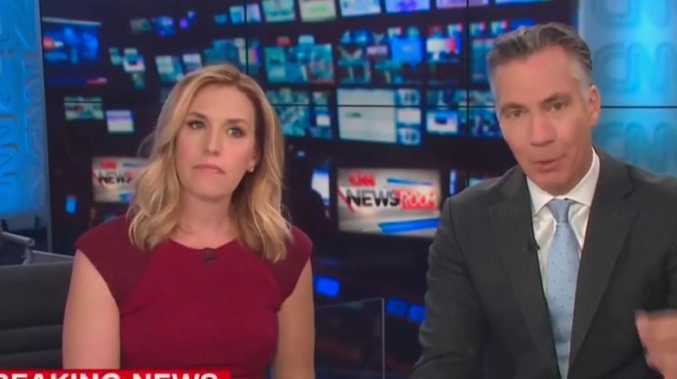 SEASONED CNN news anchors Poppy Harlow and Jim Sciutto were forced to make a terrifying on-air evacuation when they realised they were potential targets in their own story. The live footage emerged as at least five explosives were sent to targets including Barack Obama, Hillary Clinton and CNN's New York bureau, triggering mass evacuations and placing the United States on high alert. 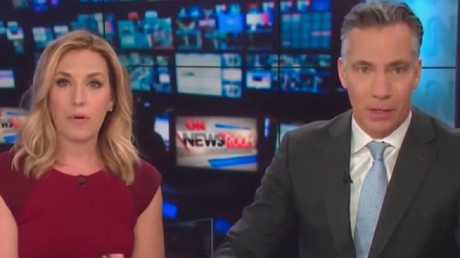 Before they knew that their workplace had also been targeted, the hosts were live on air talking about the packages sent to Obama and Clinton. In a haunting moment, the pair begin to look at each other when the fire alarm sounded in their building. However, they carried on with the broadcast and cut to a live interview with former FBI assistant director Thomas Fuentes. However, it became clear that the alarm wasn't going to stop as staffers and assistants could be seen rushing out through a door behind the studio. Harlow then told viewers the show would be coming to an abrupt end due to the threat. "There is a fire alarm here … we'll be right back," he said. They tweeted from the street afterwards to explain they too had been evacuated and posted pictures of the dramatic scenes outside. The devices, which officials said shared a similar design, were aimed at prominent Democrats and a cable news network often criticised by political conservatives. A similar device was found on Monday at the New York compound of liberal billionaire George Soros, a major contributor to Democratic causes. The bombs overtook other campaign news in an already tense political season, which has included pitched fights over immigration, the Supreme Court and sexual violence against women. "Acts or threats of political violence have no place in the United States," President Donald Trump said. "This egregious conduct is abhorrent." The US Secret Service intercepted a bomb addressed to Hillary Clinton at the home she shares with former President Bill Clinton in Chappaqua, New York, and another that was sent to former President Obama at his home with Michelle Obama in Washington DC. 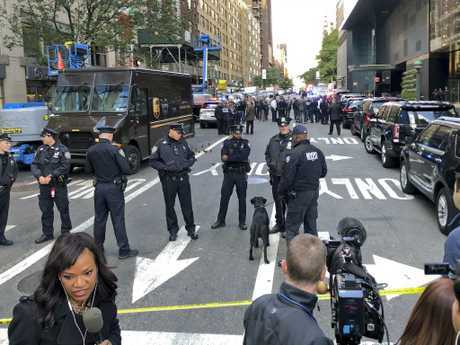 A police bomb squad removed still another from CNN's New York headquarters, which was evacuated. Overhead TV shots showed a truck carrying that device, which law enforcement officials said was linked to the other explosives being driven away. The package sent to CNN contained a live explosive and envelope with white powder, and officials said the substance was being tested to see if it was dangerous. "We will not rest until we stop these hazardous devices from being mailed and bring the individual or individuals to justice," FBI top counter-terrorism official Bryan Paarmann said. The FBI also said it was responding to a report of a suspicious package at a Florida office of Congresswoman Deborah Wasserman Schultz. Governor of New York Andrew Cuomo said his office received a similar package, but New York police officials said the office was cleared and no device was found. At a briefing, Mr Cuomo said: "We will not allow these terrorist thugs to change the way we live our lives." A US official told the Associated Press that investigators believe the explosive that was discovered near the Clintons' home was linked to the one found at the Soros compound. 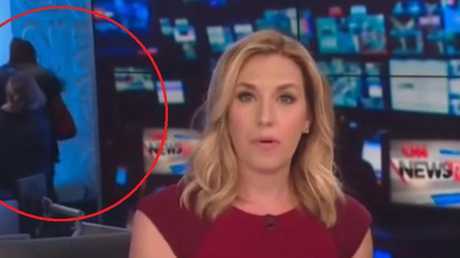 The official noted that one of the packages had the return address of Florida Representative Ms Schultz, a reference to the former chairwoman of the Democratic National Committee who was accused by Clinton rivals of secretly helping the party's eventual presidential nominee. New York Police stand outside the Time Warner Centre. White House press secretary Sarah Huckabee Sanders said in a statement: "These terrorising acts are despicable, and anyone responsible will be held accountable to the fullest extent of the law." 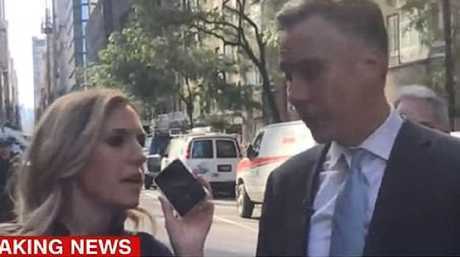 Two law enforcement officials, speaking to AP on condition of anonymity to discuss an ongoing investigation, said the pipe bomb at CNN was crude but operational and was addressed to former CIA Director John Brennan, who regularly appears as a television contributor and who has publicly clashed with Mr Trump. They said it was similar to other explosives discovered in the past few days. 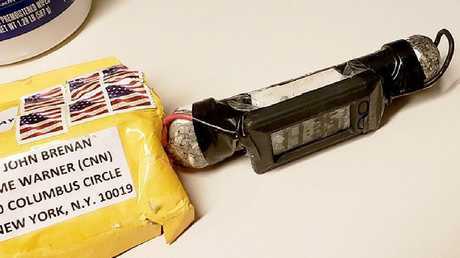 The device was sent in an envelope to CNN's offices on Columbus Circle using six stamps. It was compact, perhaps about the length of a wooden spoon, and contained wires and a black pipe, officials said. Hillary Clinton was attending campaign events for Democrats in Florida on Tuesday and Wednesday and was not at the family's New York residence at the time. However her husband, former US president Bill Clinton, was at the family's Chappaqua home when the package was intercepted on Tuesday night at a Westchester County facility, according to a person familiar with his schedule. The person said the device was screened at the facility - not in proximity to the residence - and never reached the Clintons' home. A law enforcement official told AP that the package discovered at Soros' home appeared to be a pipe bomb and was in a package placed in a mailbox outside the gates of the compound. A Soros employee opened it just inside the gates, not near Soros' quarters, the official said.